The earliest known inscriptions in the Latin alphabet date from the 6th century BC. The Romans used just 23 letters — not 26! — to write Latin; that’s after they added the Greek letters “Y” and “Z” to the alphabet they inherited from the Etruscans. There were no lowercase letters. For phonetic reasons, the symbols “J”, “U” and “W” were added to our alphabet during the Middle Ages. The Latin language used an “I” symbol where we use a “J”, a “V” symbol where we use a “U”. “The “w” consonant did not exist in Latin. 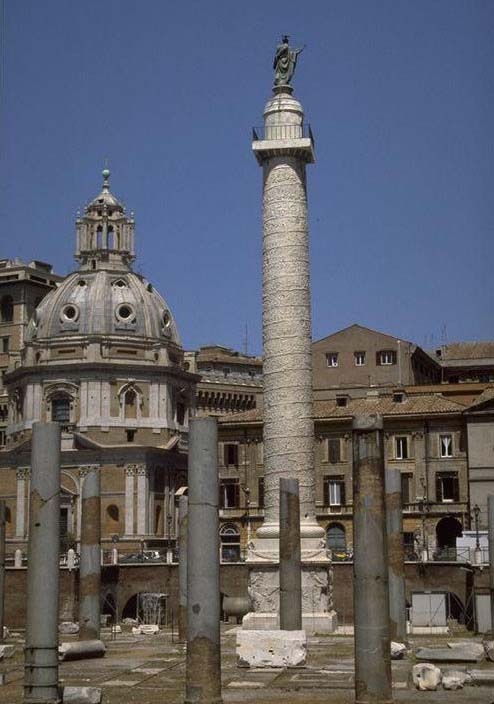 Think of the famous text “SENATVS POPVLVSQVE ROMANVS…” (“The senate and people of Rome…”) as you for instance find it on the base of Arch of Titus, constructed in 82 AD to celebrate the victories of emperor Titus. Ironically, inscriptions of the Romans on, say, stone monuments (“capitalis monumentalis”) are more readable than manuscripts from the Middle Ages and documents from the 19th century! 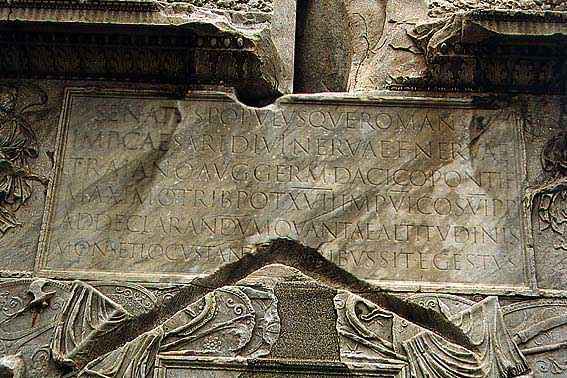 The examples below illustrate the Trajan script, so-called because it was found on the base of Trajan’s Column, constructed in the year 114 AD to celebrate emperor Trajan’s victory over the Dacians. Because of its regular, “geometric” character and its simple but impressive elegance, these serif letters on the base of the column (now called Trajan) unarguably became the most infuential version of ancient Latin script. Suffice it to say that the uppercase characters of the Latin alphabet as we now know it to be used by most languages are simply based upon it! An eminently recognizable and perfectly legible typeface, isn’t it? The “tail” on the letter “Q” is a dead giveaway. Not to mention that its clarity has never been improved upon! 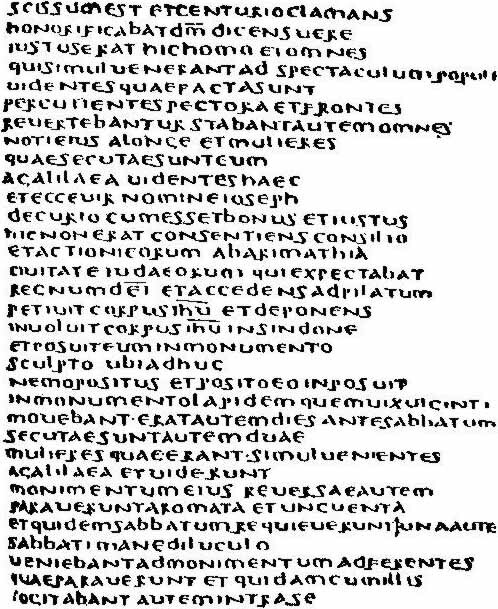 As the Roman era came to an end, this script was abandoned in favor of the uncial script that would be used from the 3rd to the 8th centuries AD. Still no lowercase characters, but ascenders and descenders were added to the letters in the course of the 6th century, which gives one the impression that uppercase and lowercase characters are mixed! Towards the end of the 8th century, we saw the first post-Roman empire governed by Charlemagne, who installed of education policy based on literacy and writing schools (“scriptoria”). 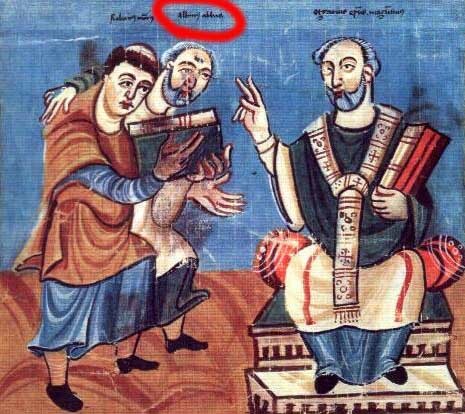 As a result, the English scholar Alcuin of York, head of the scriptorium in Charlemagne’s capital Aachen, morphed the uncial script into Carolingian lowercase script. This script would be used from 800 to 1200. Carolingian script was clear and legible with rounded shapes. This script clearly distinguished the lowercase and uppercase characters. It also put spaces between the words — a novelty: the Romans put a dot between the words, uncial manuscripts started using word separation at a late stage. 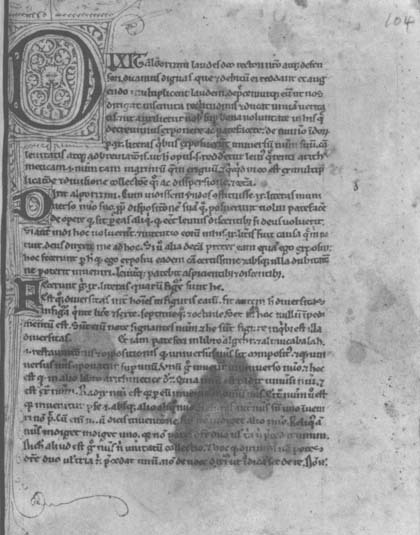 Contrary to the Gothic fonts that replaced the Carolingian minuscule, the Carolingian script seemed so “classic” to the Renaissance printers such as Aldus Manutius that it looked truly “Roman”, so the Humanist fonts were based on it. In this sense, Carolingian script was the basis for our modern Latin-alphabet fonts…! 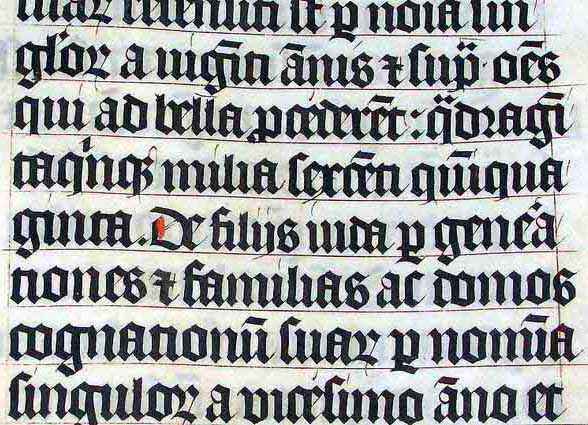 It’s easy to see how the Gothic fonts (often called “Fraktur” or “blackletter”) used in Europe until 1941 were derived from the uncial and Carolingian script during the 12th century! 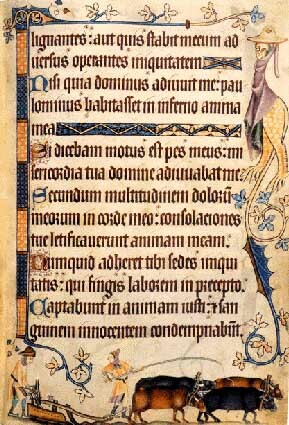 Gothic typefaces offered a real advantage to the scholars that produced the manuscripts: the previous script, although easily legible, was time-consuming and labour-intensive to copy. Furthermore, the letter shapes are wide and take up a lot of space on a manuscript. Hence the thinner blackletters dominated by thick vertical strokes. It is thanks to the Gothic fonts of the 12th century that the modern “t” was born: the letter’s “stem”, the basic stroke, got higher, timidly crossing the x-height of the letter. Even today, the “t” character is often lower in many typefaces than the other symbols with an ascender! The “monumental” Roman uppercase characters and the uncial lowercase characters constitute the basis of the modern alphabet. The Renaissance culture with its “humanistic” scripts was based upon these symbols. And when you realize that the printing press was invented by Johannes Gutenberg around 1450, you see the direct connection with the printed fonts we still see nowadays in papers, magazines etc. The modern Latin alphabet comprises 52 letters, including both upper- and lowercase characters, 10 numerals (“digits”), punctuation marks and a variety of other “special” symbols such as “&” (the ampersand), “°” and “@” (at sign). Many Latin languages add a variety of accents — or should I say “diacritics”? — to the basic glyphs, and a few also use extra letters and ligatures. Accents have a number of functions: they modify the pronunciation of a letter, indicate where the stress should fall in a word or indicate emphasis in a sentence, mark the pitch or intonation of a word or syllable, indicate vowel length and visually distinguish homophones. In the English language, the use of accents is basically limited to some loan words with “résumé” at the top of everybody’s list. You undoubtedly think that the English words have never known these “diacritic” symbols. Not so: in written correspondence, not printed media, the English used the circumflex accent (^) in the 18th century as an abbreviation for the letter sequence “ugh”. “Brought” was written as “bröt“, “though” was written as “thô”… To write quickly, people used abbreviations, something we would see again much later in e-mail and text messaging (“SMS”) with cell phones…! Secondly, the ümlaut indicates “diaeresis” or the division of vowels. You indicate that two successive vowels are not a diphthong — as in for instance “naïveté” (pronounced “na-i-vu-tay”, not “nai-vy-tay”). In the English language, diaeresis is limited to some loan words, but in French for instance, the need for diaeresis is very strong (dadaïsme, Moïse, Saül)! The cedilla (the accent of “ç”), has the form of the lower part of a handwritten “z”. Indeed, the “z” is the origin of this accent! “Cedilla” is Spanish for “little Z”, “ceda” being “Z”. The “ç” character is used in French and Portuguese, the “t-cedilla” and “s-cedilla” are common in Turkish and Romanian. The tilde (~) as in “piñata”, “señal” and “campaña”, is best known because of the Spanish and Portuguese languages. is a remnant of old handwritten traditions. In the first Latin texts, the “m” and “n” character could be written above a letter, not after it. Over time, these shapes were simplified to the tilde. The following extra letters are used in Icelandic. A thorn (þ and Þ) is pronounced like the “th” in the English word “three”. The letter eth (ð and Ð) is pronounced like the “th” in “this”. Ligatures (“joined” letters) — æ, œ and ß — are used in several languages such as French, German and Icelandic. The German symbol “ß” (pronounced “es-tset”) is commonly mistaken for a diacritic symbol, but it is actually a ligature of two “s” characters. 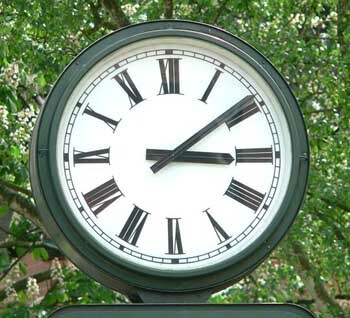 The last German spelling reform (of 1996) reduced but did not abandon the use of this special symbol! Azeri — at least, the Latin-based version of it — and Tatar use the “schwa” symbol (Ǝ and ǝ) — it looks like an inverted “e”! Contrary to the letters, the numerals of the Latin alphabet are not based on the Roman tradition! The Romans had their own complex — and unpractical — system that did not win the day. 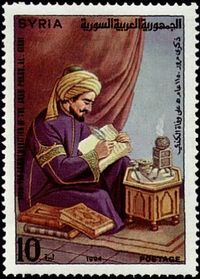 In hindsight, this choice of words is not surprising: the Arabic countries had influential mathematicians in the Middle Ages that strived for efficient calculation and bookkeeping methods! 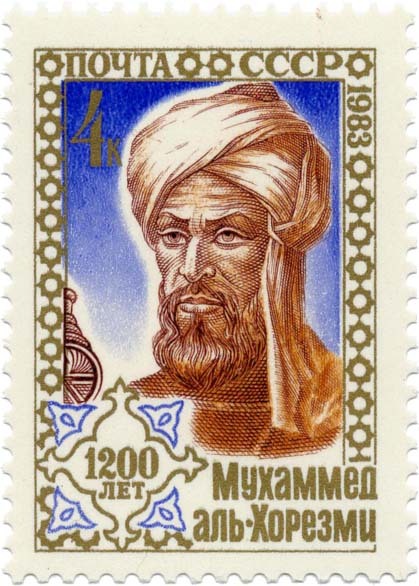 (The words “algebra” and “algorithm” have an Arabic origin.) As for the numeral system, two names were crucial: Muhammad ibn Musa Al-Khwarizmi, whose book “Algoritmi de Numero Indorum” (“On the Calculation with Hindu Numerals”) was written about 825 A.D. and survived only in the Latin translation — you see the first page below, it starts with the words “Dixit algorizmi…” — and the philosopher-mathematician Al-Kindi, who introduced the Islamic and Christian world to the Indian numerals (with four volumes called “On the Use of Indian Numerals”). So, what do the “Indian” numerals of the Arabic script look like? Here they are! Several elements complicate the situation further. For one, Farsi, another language that uses the Arabic script (a.k.a. “Persian”) uses different symbols to represent the Indian numbers 4, 5 and 6. Back to the Latin alphabet. The Arabic numerals barely changed shape during the Middle Ages: the same shapes were used for any font. 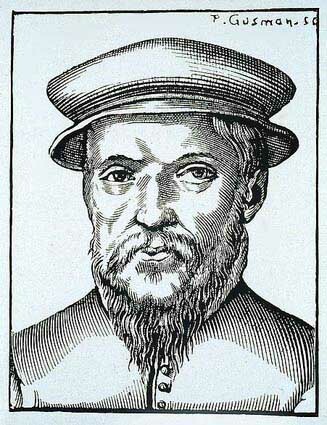 The French printer-typographer Claude Garamond (1499-1561) was the first to design new numerals styled after new typefaces! 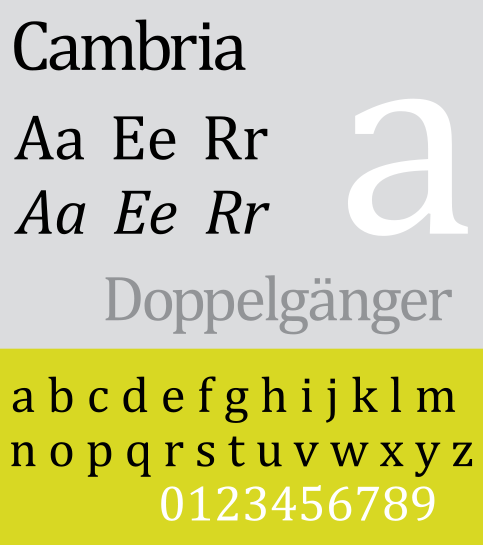 The first fonts with digits styled the numerals after the lowercase characters. That can still be the case, they’re now called “small caps numerals” or “old-style numerals”. These numerals can have ascenders and descenders: the x-height applies to them! When the Industrial Revolution started in the 18th century, the need for bigger numbers (for advertisements in printed media and billboards in the street, for instance) caused the digits to be based on the uppercase characters.